Have you been to see the fabulous Pre-Raphaelite Masterpieces in Canberra yet? With glorious paintings from the Tate, it brings together many works that have been inspired by literature. The Pre-Raphaelites were a group of painters, poets and art critics who wished to reject a mechanical approach to art (they felt that Raphael had been a corrupting influence on the teaching of art, and wanted to return to ideals that pre-dated him). They felt art should tell a story and they aimed for a close affiliation between art and literature. Many of them wrote themselves, including Dante Gabriel Rosetti and his sister Christina Rosetti, William Morris and Thomas Woolner. The Pre-Raphaelite artists illustrated volumes of poetry, and turned to Shakespeare, Chaucer, Dante, Tennyson, the Romantic Poets and myths and legends for inspiration. 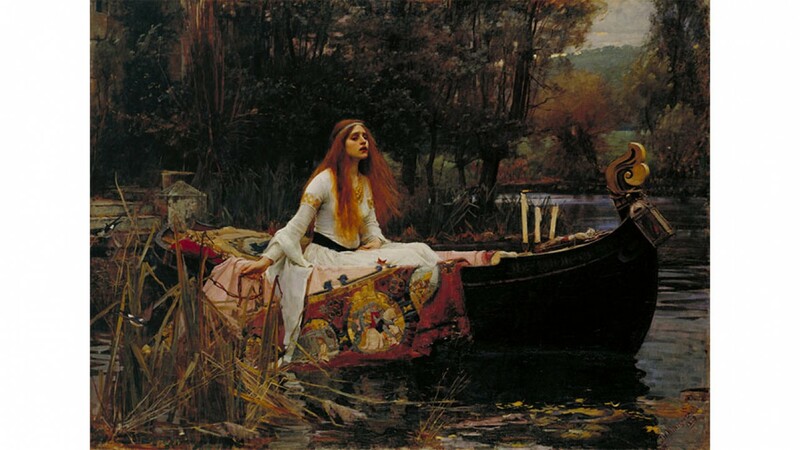 My two favourite paintings in the Canberra exhibition are ‘The Lady of Shalott’ by John William Waterhouse, depicting the lady from Tennyson’s poem sitting in her boat and floating down to Camelot, and John Everett Millais’ drowning ‘Ophelia’. Other literary pictures in the exhibition include William Holman Hunt’s ‘Isabella’ and ‘Isabella and the Pot of Basil’ inspired by the Keats’ poem of that name, Ford Madox Brown’s ‘Chaucer at the Court of Edward III’, Frederic George Stephen’s ‘The Proposal” inspired by one of the Canterbury Tales, and John William Inchbold’s Wordsworth-inspired ‘The White Doe of Rylstone’. There’s Rosetti’s ‘Dante’s Dream’, ‘Paolo and Francesca da Rimini’ and ‘Arthur’s Tomb’, Arthur Hughes’ ‘La belle dame sans merci’ and Rosetti’s portrait of his sister Christina. A section of the exhibition holds paintings inspired by myths so there is masses for the reader to enjoy. William Morris was not officially one of the Pre-Raphaelite Brotherhood, but he was very friendly with many in the group and promoted their aims. His painting ‘La belle Iseult’, based on the legend of Tristram and Isolde, is on display in Canberra. Morris was a truly remarkable man. When he died his doctors said it was because he had tried to fit into his life the lives of ten men! He was a prolific poet, a novelist, a painter, textile designer, socialist, translator, interior decorator and conservationist. I will be giving an illustrated talk about this remarkable man at the Art Gallery of NSW on Sat. 9th March, 2-3pm. I do hope you can come along. William Morris, assisted by Philip Webb and Henry Dearle, The Forest, made by Merton Abbey Workshop, London, by William Knight, John Martin and William Sleath, 1887. Were you able to get to Canberra to see Pre-Raphaelites exhibition? I’d love to hear your opinion of these works so please leave a comment. Book here for my William Morris talk at the Art Gallery of NSW. Love & Desire Pre-Raphaelite Masterpieces from the Tate at the National Gallery of Australia, Canberra. I only recommend books I have read and know. Some of these links are my affiliate links. If you buy a book by clicking on one of these links I receive a small commission. It doesn’t cost you anything extra, but does help cover the cost of producing my free newsletter. Comments are moderated, and will not appear until approved. Body image credit- William Morris (1834–1896) assisted by Philip Webb (1831–1915) and Henry Dearle (1860–1932), The Forest, made by Merton Abbey Workshop, London, by William Knight, John Martin and William Sleath, 1887. Keep up-to-date with Susannah’s events and other literary news. We will only send relevant messages and your email address will not be shared with anyone else.